This commentary has been specifically formatted for theWord. Comments are properly divided verse by verse instead of the previous version's bulky, chapter-by-chapter division. Greek and Hebrew are properly rendered. 20 megabytes of commentary on nearly every Greek word in the New Testament! Missing comments from the previous version restored — 7,075+ comments in this version. This classic, time-tested reference is written in English on the Greek text of the New Testament. 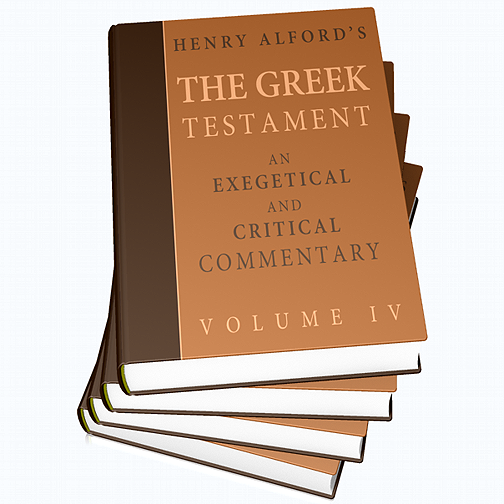 Written from 1849-1861, Alford's Greek Testament became Henry Alford's lasting legacy. Alford provides grammatical, literary, lexical, and textual analysis on nearly every Greek word in the New Testament. The commentary's scholarship is exemplary, as it emerged in a era when people were more disciplined and educated. It's a work of immense thought and study. When you consider the amount of information Alford had to filter, study, and analyze, all before the age of digital retrieval systems, photo copiers, and electric typewriters, the results are even more impressive. Even today, Alford remains one of the most influential, authoritative Greek commentaries, often cited in books, dissertations, and blogs. John Piper says The Greek Testament "comes closer more consistently than any other human commentator to asking my kinds of questions". John MacArthur's Masters Seminary, who lists this resource with a must-have asterisk in: 850 Books for Biblical Expositors. Charles Spurgeon says The Greek Testament "is an invaluable aid to the critical study of the text of the New Testament. You will find in it the ripened results of a matured scholarship ... generally highly impartial, always worthy of respect"